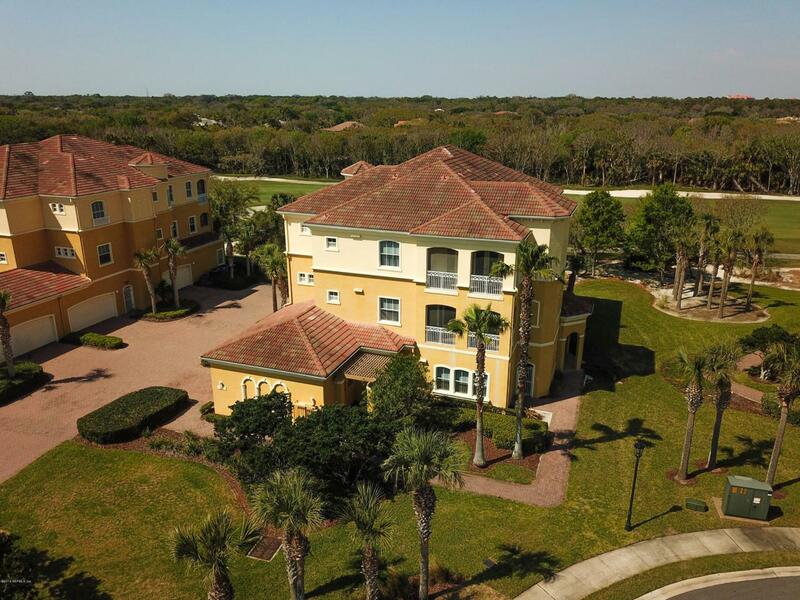 Casa Bella, an upscale group of 3 story condos is located in prestigious Hammock Dunes. This third floor condo faces the 10th fairway of the Fazio golf course, with direct expansive views from the very large sunset balcony. Enjoy the views of the golf course & conservancy & the sounds of nature as you relax in your beautifully appointed luxury condo This luxury condo lives like a single family home with high ceilings, custom cabinetry for ultimate convenience and functional living, an open floor plan with a custom kitchen, fireplace & added touches of a wood ceiling, crown moldings, hardwood & tile floors, walk in jacuzzi tub, Murphy bed & fireplace. Enjoy your morning coffee on the sunrise balcony. Oversized two car garage which opens to the vestibule and elevator.Just some of the features that make this upscale condo the ultimate in luxury living. Steps from the beach, large pool, exercise facilities, and outdoor kitchen. Carefree living at its best! !Palm Coast is the best kept secret in Florida.Miles of beautiful beaches, over 125 miles of bike paths, beautiful parks along Intracoastal Waterway , a thriving art & theater community, home of famous artists, golf courses for every day, fishing, boating, wind sailing, surfing, canoeing are just a few of the things to do.Disney World & all that Orlando has to offer is 1.5 hours, Jacksonville with all the shopping one could desire & the famous Mayo Clinic is one hour.NASCAR & ST. Augustine are within a thirty minute drive. Memberships are available to the Hammock Dunes Club with two Signature Golf Courses, Tennis, Pool, Fitness Center. Membership to the Hammock Beach Resort is also available with 5 Restaurants, 5 Pools,Fitness,2 Golf Courses,Lazy River etc. A Must SEE!